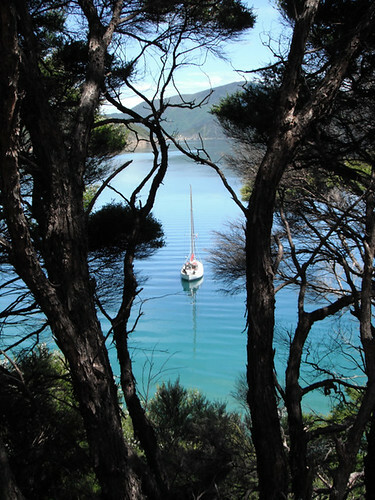 Scream spent two crazy weeks in Pelorus Sound, part of the Marlborough Sounds of New Zealand’s south island. We anchored in seven places along Pelorus’ 380 km of shoreline, which will get their own posts. Our friends on Clara Katherine have this amusing book entitled, My Dream to Cross Cook Straight Or Bust. I don’t recommend the book but I appreciate the sentiment. Cook Straight is, without question, one of the most dangerous waterways in the world. Like the Columbia River Bar, Cook Straight’s reputation is inflated as the high volume of traffic inherently causes a high number of shipwrecks. Objectively, few waterways have currents as strong as Cook Straight, and fewer still funnel the roaring fourties. Still, living in Wellington we can’t fail to know what is going on in Cook Straight. Most weeks there are one or two days of calm weather, along with one day each of moderate northerly and southerly breeze. We were prepared to wait but found fair winds and following seas on the days that suited our calendar schedule. We sailed north to the South island (yes, travelling from one island to the other across Cook Straight involves going the opposite direction you would expect) with 10-15 knots of South Easterly. Our return trip had 10 knot northerlies interspaced with calms. NZ 6152 shows a 4.5m shoal at 41 south by 174 03 43 E, stretching 140m from shore. The depth 50m from shore was over 20m. This same chart (6152) shows the passing between Danger Point and Keep Clear Rock in Waihinau Bay involves crossing the 20m line. We made the passage twice, neither time did we see less than 21m, after adjusting for height of tide. This same chart (6152) shows a 2.9m shoal stretching 160m from shore in Waihinau Bay. Again, 50m from shore we found more than 20m. Both 6152 and 6151 show a shoal (which they can’t agree on either 0.9m or 0.1m) stretching over 100m from shore at the north end of Chance Bay. This shoal appears to be entirely absent. If it is present it is less than 20m from shore. I agree that this is nit-picking. But the last time we detected a single error in one of our charts we were in the third world. 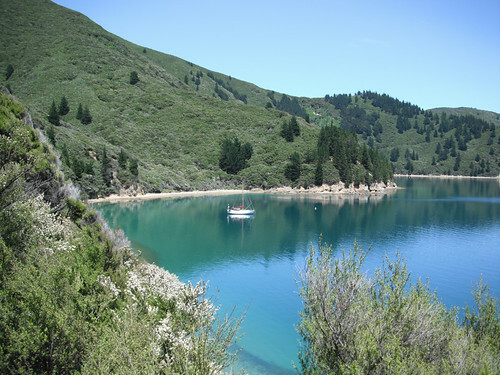 There is only a single cruising guide for the Marlborough Sounds. We were rather disappointed in it. It is one of the guides that predates computers and uses hand drawn charts. Unfortunately its quaint, nostalgic qualities are its strengths. The description that it provided for most of our anchorages differed significantly from our impressions. Its discussion of the tides in Cook Straight also did not align well with our experiences. I’ve just laid out two very strong negatives. If neither the charts nor the cruising guides are reliable, how can a boat the safely operated in the Marborough Sounds? Well, the charts overstate the shoals, so the waters that are shown to be shoal free are safe to navigate. So the problem is that the anchorages are much smaller than depicted, often to the point of being unsuitable for even a single keel boat. You just have to allow time to move on to another anchorage. There is this story that makes the rounds that Marborough Sounds have better weather than Wellington. If our experience is anything to go by, then this statement is simply untrue. The high hills seem to have no effect on the wind strength. In most of our anchorages we were subjected to winds stronger than forecast for the Abel forecast area, even though we have in the past been good at picking anchorages that provided wind shelter. More troublesome, in several of our anchorages, particularly Chance Bay, the wind funnelled from a completely different direction at water level than what the clouds and forecast led us to believe was the true wind direction. Storm-force gusts are difficult enough at anchor without an unexpected lee shore and a mile of extra fetch. In general expect winds stronger than Abel but weaker than Cook when in the sounds. Do not plan to receive any wind shelter. The sounds are liberally littered with mussel farms with a peppering of fish farms. These aquaculture facilities crowd some anchorages into non-existence, and detract from the area’s natural beauty. Though the forestry practises on land don’t help either. I can recall several people suggesting that Marlborough Sounds are one of the world’s best cruising grounds. With that expectation I am not surprised to be profoundly disappointed. Frankly, they are no better than the Bay of Islands or the Hauraki Gulf. If you find yourself in Wellington with a boat, then by all means visit the sounds. But don’t sail to New Zealand to see them. good work, aside from all the salty mumbo jumbo. are you generously cc’ing your findings to the relevant “authorities”? very nice to once again get a travel blog from you guys with lovely pictures. Years ago, I was a cartographer. I didn’t work on nautical charts (I primarily worked on maps) but I did work with people who did. The main difference between maps and charts, is that on land, changes happen because man makes them happen. In the sea, it’s because mother nature does. Shoals shift, appear, and disappear. Buoys get shoved around, broken free of their moorings, and sunk. It’s ever-changing in a way we land dwellers don’t really get to see very often. Corrections get sent in to the authorities that make the charts all the time, but the corrections don’t necessarily get published right away, except in Notice to Mariners. If you want to make sure your charts are in the best possible shape (such as, if you’re going to go through some difficult waters) then you need to check NTM to find the most recent corrections. there are maritime navigation apps in the apple app store that claim they are updated frequently and for free i think.